The Manistee River watershed in northwestern Lower Michigan contains important ecosystems and a number of valuable natural features. Unfortunately, development and changing land use threaten the ecological integrity of much of the watershed. The Grand Traverse Regional Land Conservancy (GTRLC) and other conservation organizations and agencies have recognized the importance and vulnerability of the region and have begun to push for larger scale protection efforts in the watershed. As GTRLC looked to expand its own efforts in portions of the watershed, it recognized the need for a plan that evaluated the relative conservation value of the entire area and prioritized the best lands for protection. 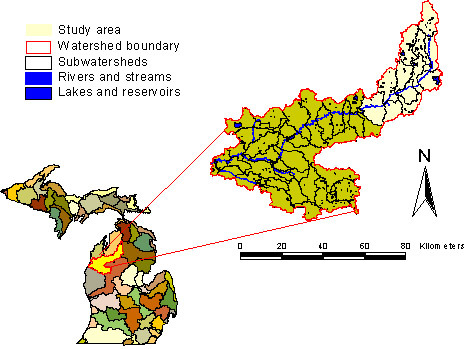 In the spring of 2001, a group of seven graduate students at the University of Michigan's School of Natural Resources and Environment contacted the GTRLC and agreed to develop such a plan for the upper portions of the Manistee River watershed as their Master's project. Both parties stressed the importance of developing a plan that had immediate on-the-ground utility for GTRLC in its efforts to protect significant tracts of land in the region. Most sections of the project are available in PDF Format by individual chapters and subsections. Please note that this project incorporates large graphic files throughout the project in the form of GIs maps and layouts. We recommend downloading the newest version of Adobe Acrobat (Reader 5).